Marc talks about what happened today in history, including the first slave revolt in continental North America, the day Howard University students sat in at Thompson’s Restaurant, and the birthday of jazz great Charles Mingus. This is Marc Steiner, and today is April the 22nd. We open this day in history with a poem by Eduardo Galeano, the author of Open Veins of Latin America. This poem is from his book Children of the Days .. A Calendar of Human History. 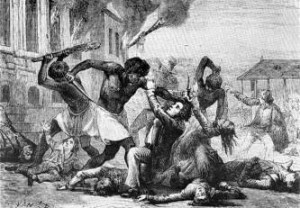 The first slave revolt in continental North America took place today in 1526 in what is now South Carolina. Lucas Vasquez de Ayllon, a Spanish colonizer, founded a town near the Pedee River with 500 Spaniards and 100 enslaved Africans. Native people were hostile to the settlement, and the Africans revolted, killing most of the Spaniards. They escaped to live with the Native people. The sit-ins of 1960 in Greensboro, North Carolina are known to many, but today in 1944 students from Howard University sat in at Thompson’s Restaurant, continuing a movement that began in 1943. But Southern Segregationists in Congress controlled the budget of Washington, DC and Howard University and squashed the demonstration with threats of cutting off funds to the university. There was a concentration camp in Croatia called Jasenovac that housed not just Jews, but Romas and many political prisoners. Tens of thousands of Jews, Romas and anti-fascist were murdered there, and today in 1945 they revolted. Five hundred were slaughtered and 80 escaped in an untold story of resistance. Happy Birthday to Catherine L. Hughes, business executive and radio and television personality. She was born Catherine Elizabeth Woods in Omaha, Nebraska. Hughes and her husband formed Radio One in 1979. In 1980, they bought their first radio station; in 1999 Radio One went public, making it the first African-American, female-owned company on the stock exchange. Here’s a song to think about today, April 22nd. It’s by a groundbreaking jazz bassist. His music defied easy categorization. He drew on gospel, free jazz, hard bop and classical music. As a bandleader, he pushed his musicians to improvise collectively in the spirit of New Orleans second line groups. He was known as a simultaneously angry and loving man. At one gig, he punched saxophonist Eric Dolphy in the head after he hit a bad note. Later that night, after a particular sweet solo, the bandleader approached Dolphy and kissed him on the lips instead. I’m talking about Charles Mingus, who was born on this day in 1922, and this is his song Better Git It In Your Soul..